At Thrive, our passion statement is: Love God, love one another, and pass it on. That passion statement is constantly reinforced through our messages, through our small groups, through our literature, and through the various means of communication that we employ. We have a bi-lateral approach to the “pass it on” part of that statement. We believe that the leadership must, with the help of the Holy Spirit, organize “pass it on” events that the faith community can be a part of. We also believe that individuals, with the help of the Holy Spirit, must respond to opportunities to “pass it on” in their daily lives, on their own. This photo represents a synthesis of that bi-lateral approach. 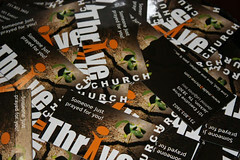 Thrive invested in the printing of thousands of these cards that say “Someone just prayed for you!”, with the Thrive contact information (just in case). The idea is to help make it easier for our people to reach out and make a difference in the lives of others, by letting the card speak for them as they get used to the idea of performing intentional, but random acts of kindness. The card idea sounds like a great "icebreaker" idea when getting to know someone and then being intentional about sharing your faith with them. I used to be so fearful of talking about God with ppl who don't know Him, and I know ppl in our church who are the same way. They say, "I'm just not a people person, and I have no idea how to start the conversation." I can see how it would be a great tool for outreach to give ppl the information they need so that when they want to know more, they'll remember you and consider coming there. Ellen – exactly – a tool to help the conversation begin!